Scientistsare hoping for a literal slam dunk with NASA's upcoming Lunar Crater Observationand Sensing Satellite, or LCROSS mission ? an event to be observed by acoordinated network of Earth and space-based equipment. 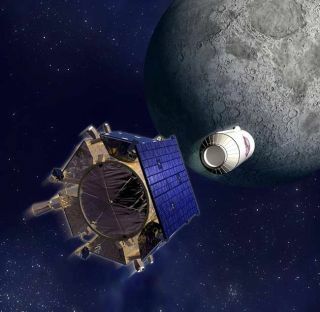 LCROSS willsearch for waterice on the moon on Friday morning by crashing its spent upper-stage Centaurrocket into Cabeus, a permanently sunlight-shy crater within the lunar southpole region. The impact is set for 7:30 a.m. EDT (1130 GMT). ThatCentaur will serve as a heavy impactor on the moon, with scientists hoping aresulting debris plume will ascend above the moon?s landscape. The intent is totoss tons of debris and potentially water ice and vapor high above the lunarsurface. As part ofthe LCROSS mission, along with the upper stage?s ?bang-up? job, a ShepherdingSpacecraft will follow a similar trajectory of the Centaur, flying through andstudying the Centaur impact plume before it too speeds into the lunar terrain. Ground-basedprofessionals and amateur sky watchers are anxiously awaitingthe impact day, ready to observe the dust and water vapor cloud caused bythe impacts into the lunar surface. A bestguess is that the larger of the two, the Centaur impact plume, could becomeabout 12 miles (20 km) wide and reach some 5 to 9 miles (8-15 km) in altitudeabove the moon for the brightest part of the event ? which is what amateurobservers might expect to be able to see. The cloudof lunar material is expected to be bright at first, as soon as it rises intosunlight, but will fade in brightness quickly as it grows in altitude. ?This maybe thelargest event that?s been observed for a NASA mission in recent memory,?said Jennifer Heldmann, lead for the LCROSS Observation Campaign at NASA?s AmesResearch Center at Moffett Field, California. Ames isoverseeing the development of the LCROSS mission with its spacecraft builderand integration partner, Northrop Grumman of Redondo Beach, California. Heldmann?sjob includes coordinating not only amateur programs, but also those beingplanned at professional observatories. ?From westof the Mississippi all the way out to Hawaii is in prime viewing conditions.You only need a ten to 12-inch telescope. So it?s a really good opportunity fora lot of people to be involved,? Heldmann told SPACE.com. ?We?reasking anyone who observes the impact to upload their data to us,? saidHeldmann. The public can contribute via the LCROSS Citizen Science Web site by clicking here. NASA will broadcast theimpact live on NASATV beginning at 6:30 a.m. EDT (1030 GMT). The pick ofthe Cabeus crater is a good one, Heldmann noted. ?There?s a shadow that is castbehind where the impact plume will be. So there?s a nice contrast between wherethe plume will be coming up...and then the background of this dark shadow.? That finalresting site for the LCROSS mission hardware was driven by data. Informationfrom NASA?s now on-the-job Lunar Reconnaissance Orbiter (LRO) ? as well asolder data from the space agency?s Lunar Prospector that circled the moon in 1998-1999? have been correlated, showing that there?s a ?significant concentration? ofhydrogen in Cabeus, Heldmann said. LRO radardata ? not all yet publicly released ? played into the LCROSSimpact site selection, Heldmann said. That choice was also bolstered byscience output from other lunar orbiters: India?s Chandrayaan-1 and Japan?s Kaguya. ?All inall?it seemed to be the place to go,? Heldmann explained. A fleet ofEarth-orbiting satellites is at the ready to take a distant look at thecollision, including the Hubble Space Telescope; Odin, an internationalastronomy and aeronomy mission led by Sweden, with Canada, France, and Finlandas partners; the U.S. Missile Defense Agency?s Near Field Infrared Experiment(NFIRE) satellite; NASA?s Earth Observing-1 satellite; as well as thecommercial Ikonos and GeoEye-1 remote sensing satellites. Heldmannsaid that the Earth-watching spacecraft regularly use the moon for calibrationpurposes. ?So sincethey look at the moon anyway, they?re able to collect some data. We?ve beenhelping them plan out their observations?when they should time their exposures.It?s working out quite well with the Earth observing satellites and the LCROSSmission,? Heldmann said. But foron-the-spot viewing, you can?t beat NASA?s Lunar Reconnaissance Orbiter (LRO).It?s got a true ring-side seat of the LCROSS event. LRO isready for LCROSS, said Mark Robinson of Arizona State University?s School ofEarth and Space Exploration in Tempe, Arizona. He is principal investigator ofthe ultra-powerful Lunar Reconnaissance Orbiter Camera, or LROC for short. Robinsonsaid that LRO will fly perpendicularly past the impact site about 60 seconds afterLCROSS hits. Thatpost-impact look-see will allow LRO?s Lyman-Alpha Mapping Project (LAMP) toscrutinize the plume growth. LAMP, built and developed at the SouthwestResearch Institute in San Antonio, is designed to search for surface ice andfrost in the polar regions of the moon and provide images of permanentlyshadowed regions illuminated only by starlight and the glow of interplanetaryhydrogen emission. LAMP willattempt to measure spectra of the growing plume just after the impact. The orbiterwon?t fly directly over the impact, but off to the side, Robinson told SPACE.com.LRO will slew a little over 80 degrees off to the side making sure the LAMPgear is taking in a view just above the lunar horizon, thus able to see theplume against the background of space. Additionally,LRO?s Miniature Radio Frequency (Mini-RF) radar is to image the impact pointboth before and after the impact, but not during. Robinsonadded that LROC will attempt shadow imaging with long exposures the day beforethe impact as the spacecraft passes over the site. An attempt will also be madeafter the impact. If LCROSS impactsin a single shadowed region, LROC might find the impact crater. ?In adouble-shadowed region all bets are off,? Robinson said. The reasonis that single shadow areas receive sunlight bounced off a crater wall stickinginto the light. A double shadowed area only receives light from two bounces ?for example, the interior of a small crater that is entirely inside a largershadowed crater, Robinson added. CouldLCROSS come up dry in the sense of running into lunarwater ice? ?Whateveranswer we get back, if we see ice or we don?t, is going to be significant,?said NASA?s Heldmann. Seeing ice, she continued, will enable scientists tostart quantifying the material, to agree on how much is resident within thecrash zone. Notdetecting the material means there?s no ice in the impact spot? ?So eitherit?s not there?or there?s some patchiness and spottiness to it?if it is indeedthere,? Heldmann added. ?We?re going to learn a lot no matter what results areobtained.? On impactday, the science operations center at NASA?s Ames Research Center will be abusy hub, given the expected onslaught of incoming data. Within two-and-a-half hourspost-impact, a press conference at Ames Research Center will be held making useof mostly ground-based observations. Accumulating the data gleaned bymoon-watching spacecraft will take longer. The LCROSSShepherding Spacecraft is collecting data continuously during its plunge thoughthe plume and transmitting it back to Earth before its own demise. Overall,observations in the near infrared, such as those made by the Infrared TelescopeFacility and Keck telescope in Hawaii, are expected to provide quick look andlearn findings about any subliming water vapor in the LCROSS ejecta curtain. There?s alarge cadre of professional astronomers using many of the Earth?s most capableobservatories is helping maximize the scientific return from the LCROSS impacts,including the Magdalena Ridge and Apache Ridge Observatories in New Mexico andthe MMT Observatory in Arizona. ForHeldmann, she?s prepared for impact day?ready to scan and span the spectrum ofdata to be gathered. ?It has beena lot of work for four minutes of data?but it?s a really important four minutesof data,? Heldmann said. ?Hopefully, we?ll have a variety of data sets that wecan combine and make a coherent story. That?s the going-in plan.? Video- Why Bomb the Moon?